For Shari Kocher, the year 2015 will probably be remembered – to borrow a phrase from her poem ‘Bellbird Gully’ – with ‘a spume of wonder’ (29). She published The Non-Sequitur of Snow, her first collection of poetry, and was awarded a Doctor of Philosophy from The University of Melbourne for her PhD thesis on the verse novels of Dorothy Porter and Anne Carson. 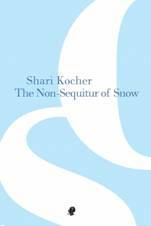 The twenty-six poems that make The Non-Sequitur of Snow reveal Kocher’s interesting background of having lived and written in many places over the last two decades. A diverse richness of experience is clearly evident in this debut collection which spans dreams, observations, memory and moment; moments such as those in ‘Notes from the Abyss’ where ‘a candle holds its lit canoe / afloat in a bowl of wax’ (17). Kocher’s poems follow the dictate in ‘Bellbird Gully’; her work is always ‘approaching the very whatness of things’ (29). Appealing to the clarity of haiku, Kocher’s work sustains precision but also embodies a quiet yet deep sensuality. We see this in the poems, ‘Cut’ where‘soft faces cotton the touch’ (37), ‘My Singing Empty Hands’ in which ‘my sister’s tears / taste like lamingtons’ (40);and ‘My Beautiful Fig Tree’with ‘its furry umbrella / bulging / with purple fruit’ (47). They are simultaneously sparse and lush – evidence of Kocher’s patient experience and sharp eye. Many of the poems weave delicately into domestic imaginings: ‘Dreaming in Auslan: a Study in Yellow and Grey’ with ‘those curtains she hung like mustard’ (35); ‘Spoons’ with ‘their metal mouths / pursed and shrinking’ (27); and the gently-rhyming ‘Breakfast at Full Tide’ with ‘This billowing / tide enclosed, awash with dishes and dirty sun- / light, flooding the walls with mashed banana’ (28). Children, family, and nature are a loving texture throughout the book. Let rain in a cup be. Let the hour. Kocher’s work is not all free verse. Some structured poems such as ‘Flow, Repetition, Decay’ and ‘Swim’ are offered. They are structured in different ways to each other, but again show the firm mastery of Kocher’s pen. How to hold this pause of silence in a piece of music? Understanding, however, as a break in silence, is achieved not just through each poem, but also through the ordering of Kocher’s collection. The sequencing of ‘Clay’, followed by ‘Spoons’ and then ‘Breakfast at Full Tide’, for example, is pleasing. Similarly, the confrontation of ‘The Bridge’ is healed through the clarity of the next (and final poem in the collection), ‘Blue Irises’. Although it is possible to dip into random poems, the structure of The Non-Sequitur of Snow is important: to read the collection from front to back cover brings an unexpected journey. The structure is not just an arrangement of words but also a treat for the eye. Based on my reading of The Non-Sequitur of Snow, I look forward to reading further narrative experiments by Kocher, namely a published version of her ‘verse novel of archaeological embodiment’, submitted as part of her PhD. Until then, The Non-Sequitur of Snow is a nurturing small feast. Monica Carroll is a poet, teacher and researcher at The University of Canberra.